The Dallas Entertainment Journal’s very own Jasmine Ellis speaks with Antonio Wingfield, Fashion Designer and Creator of the stage play, “The Awakening”. 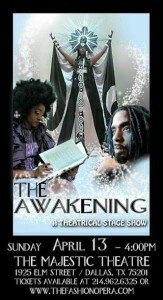 The Awakening celebrates fashion in a beautiful thought provoking production at the Majestic Theater. Be sure to check out the upcoming Encore performance at the Majestic Theater April 13th at 4 pm.